BBC eagerly pushing the agenda of a genocidal Islamist movement against an open democracy, in return for access to juicy newsreel of victims and Hamas actors playing victims. A new low in public broadcasting. 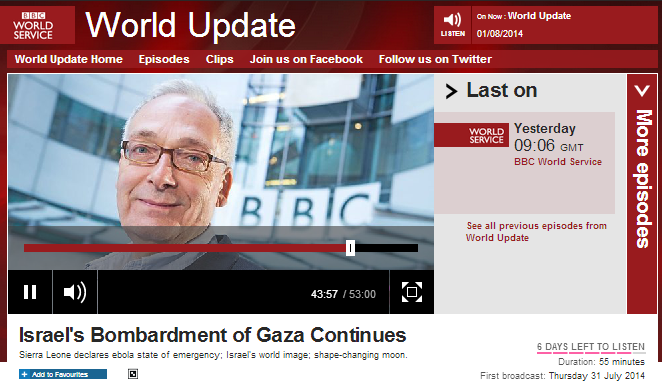 The BBC has completely espoused the radical anti-Israel worldview. Two days ago on its flagship ‘Newsnight’ programme, the star presenter Robert Peston, presumably following the BBC script, referred to Israel as ‘that other legacy of British rule’. That’s all Israel is for al-Beeb. I don’t know whether Peston is regarded as a ‘star’, but sane people regard him as a smug, ignorant moron. Like you have the “psychopathic triad” of bed-wetting, fire starting, and cruelty to animals, there is that other triad one sees an example of at the BBC: “Lawrence of Arabia syndrome”, judeophobia, and s3xual deviance (cfr. Jimmy Saville). Its hard to believe how stupid BBC is. Why do they think there are guys taking turns as human shields in those hospitals if they truly serve only as hospitals, and not as command centers or places where weapons are stocked as well? Or do they think Israelis would strike hospitals if it was not for the fanatical terror-supporters serving as voluntary human shields? I wonder who booby-trap Unraw clinic which exploded and killed 3 IDF soldiers ? and dug a tunnel which originated inside the clinic?